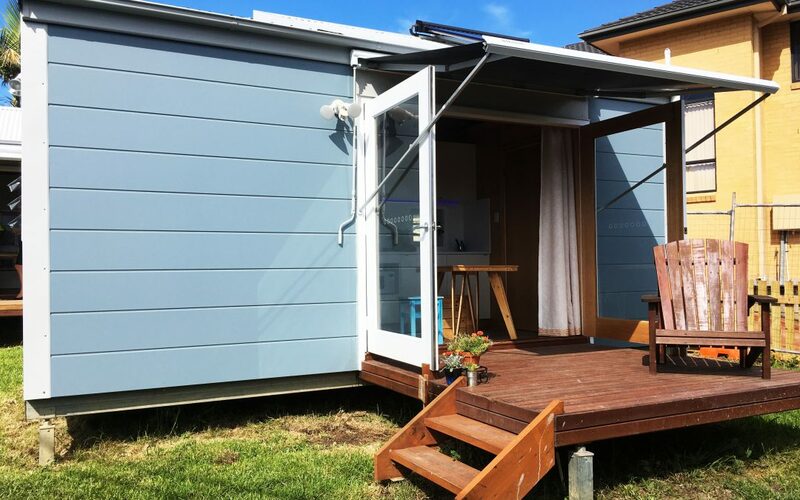 Pacific Link Housing was delighted to attend the Tiny Homes Foundation (THF) launch in February after being appointed to manage tenancies for their innovative pilot project in Gosford on the Central Coast. This project, located next to Gosford Hospital, seeks to provide sustainable and affordable housing solutions to help support people experiencing homelessness. Each tiny home covers just 14 square metres, with a bedroom, bathroom and cooking facilities, and has been architecturally designed with cathedral ceilings to make it feel much bigger than its small footprint. Now that the project has completed the construction phase and is ready for occupancy, Pacific Link is currently helping to support the process of providing a smooth transition for the new tenants into their homes. Our partnership with THF focuses on a ‘housing-first’ solution, which gives tenants the stability of safe and affordable housing, with a network of training, employment and social support services provided by Pacific Link Housing and other local partners. As with our other projects, our goal is not only to create homes, but support sustainable tenancies and provide access to further skills and opportunities for tenants to build their capacities and potentially assist with transitioning them back into the private rental sector. Both Pacific Link Housing and THF will monitor this pilot project, which if successful, may be replicated in other areas as one step in solving to the housing crisis.